The loop must pass through every circle. The loop may not turn at a white circle, but must turn at at least one of the adjacent cells in the loop. 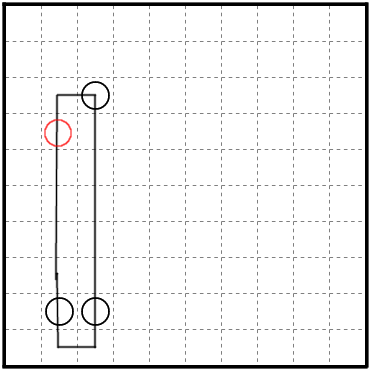 The loop must turn at a black circle, but may not turn at either of the adjacent cells in the loop. A cell without a circle cannot behave as though it had one. Or rather, all possible circles that fit the solution are given. colour the cells in checkerboard fashion -- let's say black at the top left. And colour the path red when it is entering a white cell horizontally or leaving one vertically, blue when it is entering a white cell vertically or leaving one horizontally. So the path changes colour in the middle of a cell that it passes straight through, and stays the same colour when it turns in a cell. 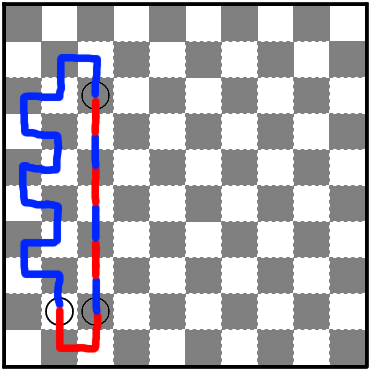 it must turn if, and only if, it turns at at least one of the adjacent squares. Equivalently, it must NOT turn if, and only if, it doesn't turn at either adjacent square. Taking just the more interesting half of that equivalence: if the path passes straight through an empty square, it must continue straight until it hits a circle. the portion of a path between any two circles is either always-turning and monochromatic, or never-turning and changing colour every square. When the path passes straight through an empty circle, it changes colour. its total number of colour-changes is even. There is one at each empty circle (since it passes straight through these), and therefore there must be an odd number of others. 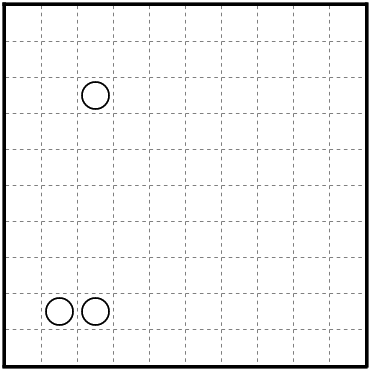 These others can happen only on a straight-line path segment -- so the path must run vertically straight through the two rightmost circles, and straight between them. it must also go vertically through the other circle. It can't go into the corner because then the square left of the left-hand circle would be eligible for an empty circle, so the path bends in a "U" below those two circles. Now, above the left-hand circle the path can't continue straight (it doesn't have a circle to aim for), so it must turn; and now in fact its every step is determined until it finally ends up meeting the other branch of the path. Can you solve this masyu puzzle?